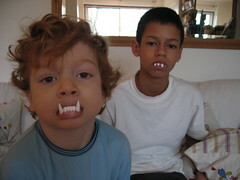 The plastic teeth were a big hit in the stocking this Christmas! Last week Prague - this week Egypt. Heavy schedule these days and all for the sake of making television commercials. Between Dec and mid Feb 2006 I worked out I will be home 14 days - not very nice when you have a four year old. Horrible in fact. Plus I miss New Year and my milestone birthday in Jan (no I will not be divulging quite what that milestone is). More tomorrow, My hotel overlooks Cairo Zoo and I can hear lion's roaring in amongst the traffic noise. Odd combination. 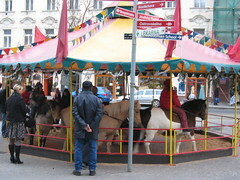 Ladies and Gentlemen...I give you...the charming Ponies of Prague! Walked around the corner from my hotel and saw this. Apparently, they only put this on in the square at Christmas for the children. The ponies looked quite happy and I couldn't see any signs of sadness or maltreatment. I'd quite like to see this in England but I think the government has changed all the laws that say anyone can actually have any fun! Which reminds me...I got a work call from a German Producer the other day enquiring (amongst other things) as to whether I had a good weekend 'binge-drinking'?! Apparently, the European news programmes (and ours for that matter) are full of items on how our nation is gripped by a binge-drinking epidemic. I was flabbergasted so I said 'yeah, it was great thanks but the Crack was better'. Short silence..."sorry I said, only joking" And then he laughed saying "oh, don't mention the war". At which point I completely lost track about precisely what we were meant to be discussing and where this rather surreal conversation was going. I was going to say something like 'well, no wonder we bloody won it' but decided to be the consummate professional and divert the conversation to something more relevant other than binge-drinking, doing crack and WW2! 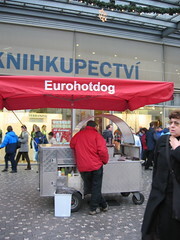 You can't use euro's in Prague yet but you can get a eurohotdog! We have a curry house around the corner from where I live in London - it's called Eurobalti which sounds utterly disgusting but tastes actually delicious. I didn't sample eurohotdog though - I drew the line there. Hello, I haven't quite abandoned the blog .....but almost. Am back in Prague filming again. Have had no time for living at all - just working. Will try to get back on my blogging horse soon. Got the morning off tomorrow - am going out traipsing the streets and looking for interesting things/people to take photo's of.